I have had my new Verizon phone for a couple of weeks now, and I like it. You don’t need to be a Geek to want one. If you are one of the many folks who want a phone just to make calls, the Droid is way overkill. For a phone, it is expensive at $200 with a 2 year contract. It’s cheap for a computer, though. Droid showing Sliding keyboard. Optional desk dock. 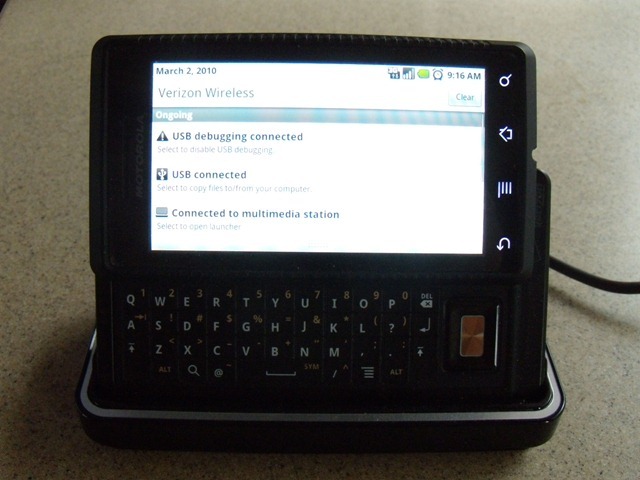 The Droid is essentially a computer that can also make phone calls. It is connected to the Internet through the Verizon cellular data network or a local WiFi network. You can browse the Internet, send and receive emails, stream or download videos/music and so much more. Texting or entering data is easy using one of the three keyboards. Some people I know could use the Droid and never need a conventional laptop or desktop computer. The Verizon data plan for the Droid is unlimited. There is no 5GB limit as with cellular data cards or tethering my old phone using VZaccess Manager. How about using the Droid’s Internet connection to connect my computer like I used to do? Well, I can. I just need PdaNet software for the Droid from June Fabrics. Tethering is the term we use to describe the hardware and software needed to connect a computer to the Internet using the cellular data connection from a smart phone. It is usually a USB connection, but could be wireless using Bluetooth DUN (dial-up network) or WiFi. A wired connection to the computer is simplest and most reliable. There are two parts of the system. A program that runs on your computer and stays in the system tray and an app on the Droid. Installation is easy. Follow the easy instructions. Download the installation program from the website and run it on your computer. Plug the Droid into an available USB port. Let the program talk to the phone for a moment to establish communication, and you are ready. First, start the PdaNet app on the Droid phone and Enable USB Tether. 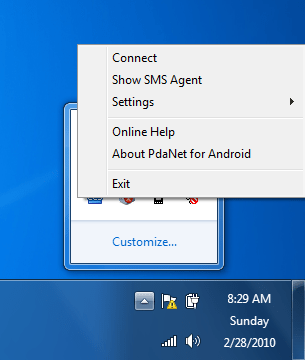 Then, on your computer, click the PdaNet icon in the system tray and connect. This is a broadband connection and speed is determined by the cellular network. In a good Verizon area, the speeds are excellent. You can easily stream video and not worry about going over your monthly data limit. The Droid is not the only smart phone that allows tethering. PdaNet has been available for PalmOS phones, BlackBerrys and Windows Mobile phones for a while. If you want to use PdaNet for the iPhone, you need to “jailbreak” it, voiding the warranty. The price of a single license is $23.95. It is a one time purchase for the Android version. One license covers one phone (you can reuse the license if you switch to a new Android phone). There is no limit on the computer side and your license gives you unlimited free upgrades. So far, there is no support for connecting to our Cradlepoint router, but I expect that fairly soon. We’ll show you how to network the connection in a future post. Published by MrGeek, in Blog. Tagged with Connect, Droid, GeeksOnTour.com, Internet, JuneFabrics, PdaNet, Phone, Tethering, Verizon. Good Evening this weblog is absolutely nice!!!! I am pretty sure Im coming back to read more posts! !